Millions of professionals use LinkedIn Groups to connect and share insights with like-minded professionals. With hundreds of thousands of career-related postings every month, Groups are also a popular way to find and share new opportunities. This week, we've made improvements to the Jobs tab in Groups that will make it much easier for group members to find and share high-quality job content. 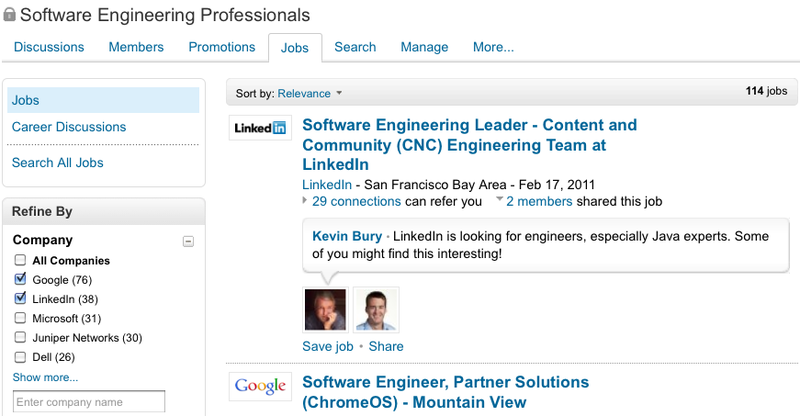 Jobs: LinkedIn Jobs specifically tailored to the group. All group members can share jobs directly into their groups. If you're a group manager, you can now set up a feed of relevant jobs into groups you manage that match keywords or filters, including company name. Job viewers can see how they're connected and refine results with filtered search to find the perfect opportunity. Career Discussions: This is the best place to share career opportunities and advice with other members of a Group. Organic postings from the old Groups "Jobs" tab can now be found here. You can share a job to a group by clicking "Share this Job" on any job description page (in order to share a job to a group, you must be a member of that group). To find relevant jobs, use the Job Search functionality or click "Search All Jobs" from the Jobs tab in your group. You can share a job to multiple groups and add a customized message for group members. To set up a feed of jobs in a group you manage, click the "Jobs" tab, click the "Jobs" subsection, and click "Get Started" in the "Create a Feed" section. Use keywords and search facets to provide a customized list of jobs specifically targeted to your group. Group managers can improve the experience for their members by setting up a daily targeted job feed. Job posters can more easily reach the right professional audience. Group members can more easily discover high-quality, relevant career opportunities within their groups. It's a win for everyone. We’re excited to bring the most relevant job opportunities to professional communities in LinkedIn Groups. It’s just one more way we hope to connect talent with opportunity.